One of the challenges in raising children is getting them to eat the right things. While my oldest child, 7 years old, eats a perfectly healthy range of food (although she does certainly enjoy indulging in sweets! ), I face the struggle of getting enough healthy food into my 3-year-old, who would happily survive on cookies, chips and French fries if he were allowed. The main problem in my 3-year-old and my 5-year-old sons is that they flat out refuse to try any new food. My daughter jumps at the chance to try something new, which is why it wouldn’t be unusual to see her devour a few sushi rolls, or putting the fire in her mouth out with a glass of milk after eating some spicy Indian food, or even eating an entire tin of sardines. At school, she’s often the girl with the weird fruit in her morning tea, with the kids crowding around her asking, “What’s that???”! Her favorite “strange” fruit to take to school is a fresh fig! For my sons, though, it’s the same old thing, every day. No variety because they refuse to try new foods. 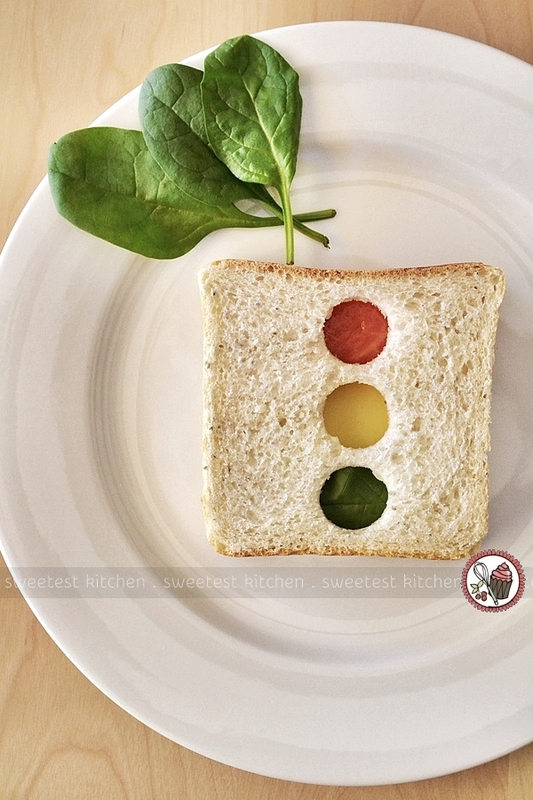 Can you believe, I couldn’t even tempt them with this attractive stoplight sandwich? This kid-friendly (for children other than my sons, of course!) sandwich is made with tomatoes, spinach, a slice of cheese, a thin layer of mayonnaise (although you could use butter or hummus instead) to hold everything in place and fresh-baked chia bread (from Baker’s Delight). Speaking of Baker’s Delight, this is where the idea for the stoplight sandwich came from – I picked up a recipe booklet from one of their shops and this recipe was in it. My daughter wouldn’t let me waste any time before making one of these sandwiches for her! Of course, you can use any type of bread you like if chia bread isn’t available. Cut three holes out of one slice of the bread. Cover the top hole with sliced tomatoes. Cover the bottom hole with baby spinach leaves. Then place a slice of cheese on top. 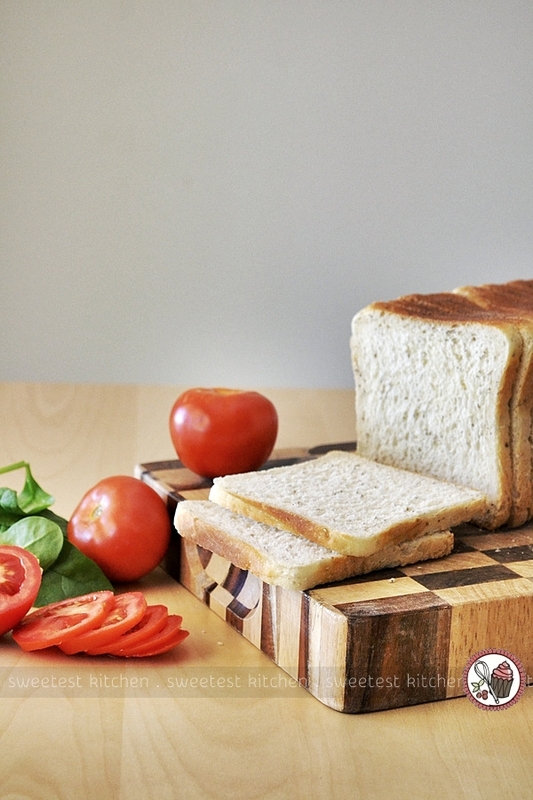 Lay a piece of bread on top of the cheese, press down lightly to secure and carefully turn the sandwich over. Ta-da! 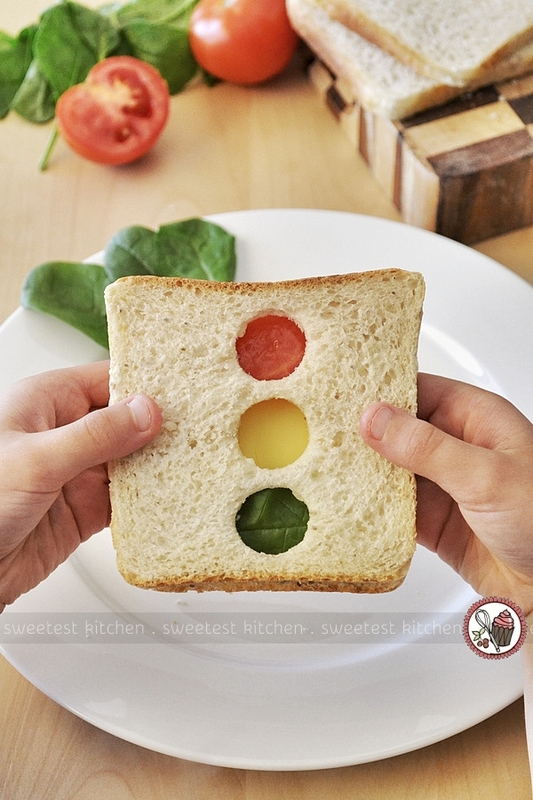 You have a healthy stoplight sandwich, and your kids – hopefully – will be delighted! This chia bread from Baker’s Delight is fantastic, by the way. It doesn’t taste like you’re eating a mouthful of chia seeds; it tastes like a lovely wholesome bread. With it’s crisp, golden crust and light and fluffy middle, there’s everything to love about this loaf! I’ve also tried the chia & fruit loaf and have enjoyed it as French toast, or for a quick breakfast I’ve popped a slice in the toaster and slathered it with butter and cinnamon/sugar. Baker’s Delight has a whole range of chia-studded bread, so be sure to check them out if you’re in Australia and looking for some fresh-baked bread. If you’re interested in more recipes using Baker’s Delight bread, including all the recipes that were in the recipe booklet I picked up, click on over to their website to browse through their recipe collection. * Note, I have not been asked by Baker’s Delight in any way whatsoever to promote their chia breads. I just simply loved the bread and wanted to share! What kind of sandwiches do your kids love? Do they insist on the same-old same-old, or are they more adventurous? This healthy chia bread stoplight sandwich is sure to get your kids interested in eating the right foods. 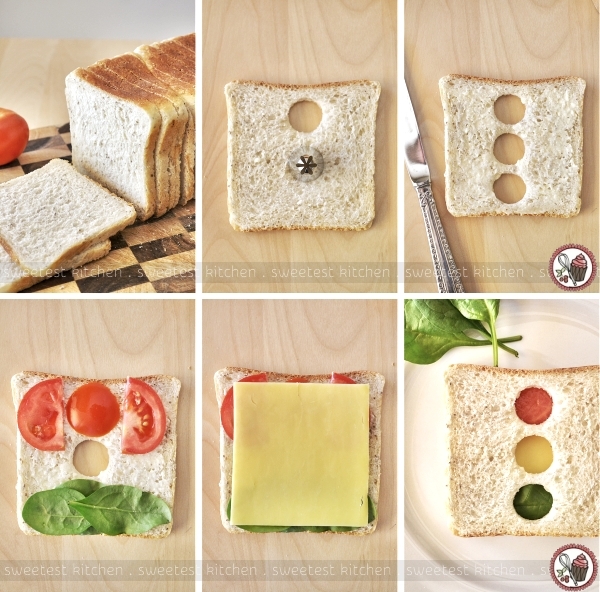 Carefully cut 3 holes (as shown in my photo tutorial above) into 4 pieces of the bread. 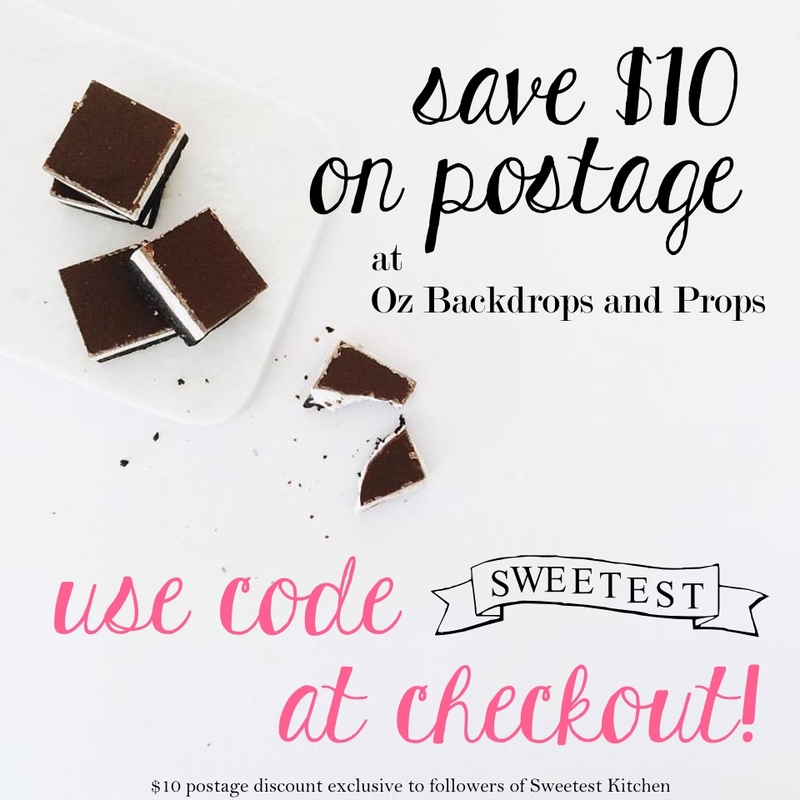 You can use the wide end of a pastry tip, a water bottle lid or a small cookie cutter to make the holes. Spread on a little mayonnaise (or other spread). Place a slice of tomato over the top hole and a couple of spinach leaves over the bottom one. Place cheese on top and gently press down then add turkey or ham, if desired. Spread a little mayonnaise (or other spread) on the other 4 pieces of bread and place on top. Gently turn the sandwich over and serve. Perhaps if you spent less time writing this retarded blog you would have more time to parent your children – they might eat real food then…? Do you really think that Baker’s Delight Chia Seed bread is the best thing they could be eating? This idea is adorably cute!